Born Willard Christopher Smith, Jr. Famous for: His role in 'Bad Boys' (1995) Fresh Prince Background: "My skin is hard when it comes to my music. But with my movies, I'm still a virgin in a lot of ways. I'm not used to being shot down for no reason." Will Smith Grammy winning rapper and accomplished actor Will Smith first came to recognition as the Fresh Prince while forming a popular rapper duo with DJ Jazzy Jeff. The duo earned praise with the single Summertime (1991) and the album He's the DJ, I'm the Rapper (1988), which spawned the hit singles Parents Just Don't Understand (1989) and Girls Ain't Nothing But Trouble. The Fresh Prince also gained rave reviews from MTV with his singles Gettin' Jiggy Wit' It (1998), Just the Two of Us (1998), and Miami (1999). 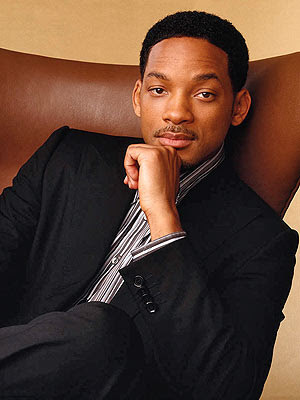 As an actor, Smith rose to popularity while portraying himself in the mega hit television series The Fresh Prince of Bel Air in 1990. He later received more attention acting in such films as Six Degrees of Separation (1993), Independence Day (1996, with Jeff Goldblum), Men in Black (1997, sequel in 2002), and Wild Wild West (1999). Smith continued to earn publicity when he starred in the biopic Ali (2001), Bad Boys I & II (1995 and 2003), as well as I, Robot (2004) and Hitch (2005) The African-American actor, standing 6' 2" inches tall, was listed as one of People Magazine's 50 Most Beautiful People in The World in 1998. He married actress Jada Pinkett Smith (Niobe in the Matrix movies) on December 31, 1997. Charming Will Childhood and Family William Christopher Smith Jr. was born on September 25, 1968 toxparents William C. Smith Sr. (refrigeration engineer) and CarolinexSmith (school-board employee). The second of four children, Will hasxtwo sisters, Ellen Smith (twin of Harry; born in 1971) and Pam Smithx(born in 1964), and one brother, Harry Smith (twin of Ellen, born in 1971). Smith was raised by his parents in West Philadelphia. Smith credits his father's dedication when discussing his own involvement in the lives of his three children: "I look at my father and how he was able to keep four kids fed and clothed and still managed to find time to spend with us." Smith married Sheree Zampino in 1992. They had a son, Willard Christopher Smith III, also known as "Trey", but divorced in 1995. Trey appeared in his father's music video for the 1998 single "Just the Two of Us". Smith married actress Jada Pinkett in 1997. Together they have had two children: Jaden Christopher Syre (born 1998), his co-star in The Pursuit of Happyness, and Willow Camille Reign (born 2000), who appeared as his daughter in I Am Legend. Along with his brother, Harry Smith, he owns Treyball Development Inc., a Beverly Hills-based company named after his first son. Smith and his family reside on Star Island in Miami Beach, Florida and in Los Angeles, Stockholm, Sweden and Philadelphia. Smith has said he has studied multiple religions, including Scientology, and he has said many complimentary things about Scientology and other faiths. Despite his praise of Scientology, Smith said "I just think a lot of the ideas in Scientology are brilliant and revolutionary and non-religious" and "Ninety-eight percent of the principles in Scientology are identical to the principles of the Bible.... I don't think that because the word someone uses for spirit is 'thetan' that the definition becomes any different." He has denied having joined the Church of Scientology, saying "I am a Christian. I am a student of all religions, and I respect all people and all paths." Smith gave $1.3 million to charities in 2007, of which $450,000 went to two Christian ministries, and $122,500 went to three Scientology organizations; the remaining beneficiaries included "a Los Angeles mosque, other Christian-based schools and churches, and the Yitzhak Rabin Memorial Center in Israel" Smith and his wife have also founded a private elementary school in Calabasas, California, the New Village Leadership Academy, which has attracted controversy and speculation over its use of Study Technology, a teaching methodology developed by L. Ron Hubbard, the founder of Scientology. On an audition for The Fresh Prince of Bel-Air (1990), Will met and fell in love with actress Jada Pinkett Smith (born on September 18, 1971). The pair exchanged wedding vows in Baltimore on New Years Eve in 1997. They have two children, daughter Willow Camille Reign Smith (born on October 31, 2000) and son Jaden Christopher Syre Smith (born July 8, 1998). Having been rapping since age 12, Will Smith, under the name of The Fresh Prince, started his demo recordings with aspiring rapper Jeff Townes (a.k.a. DJ Jazzy). The duo introduced their first record, Rock the House, in 1987 with the hit single Girls Ain't Nothing but Trouble. They finally gained wide recognition in 1988 with their Grammy winning album, He's the DJ I'm the Rapper (was certified double platinum), which spawned the hit single Parents Just Don't Understand. In 1990 Will entered the Hollywood scene. After appearing in his first TV movie, the romance-comedy The Perfect Date (1990), writer Benny Medina pointed him to the lead role of himself in the NBC's long-living series The Fresh Prince of Bel-Air (1990-1996). The show was an instant hit and helped Will catapult his name toward the spotlight. On portraying himself in The Prince of Bel-Air, Will admitted, "I was trying so hard. I would memorize the entire script, then I'd be lipping everybody's lines while they were talking. When I watch those episodes, it's disgusting. My performances were horrible." Will subsequently graced the big screen, debuting with Marc Rocco's feature drama, Where the Day Takes You, in 1992. He followed it up with the acclaimed 1993's film, Six Degrees of Separation, in which he received praise for portraying the character of Paul. Will also appeared in the film Made in America (1993) and lent his voice in the animated series Happily Ever After: Fairy Tales for Every Child (1995). A better role came in 1995 when Michael Bay cast Smith as Martin Lawrence's partner, Det. Mike Lowrey, in his blockbuster action-comedy Bad Boys, which he later starred again in its second installment in 2002. Soon afterward, Will was offered a string of distinguished roles in many major films, including Captain Steven 'Steve' Hiller in Roland Emmerich's sci-fi action film Independence Day (1996, starring Bill Pullman) and as Tommy Lee Jones' partner, Agent Jay, in Barry Sonnenfeld's adaptation of Lowell Cunningham's popular comic Men in Black (1997, he also sang), which he later reprised the role in its sequel in 2002. Smith also starred as Robert Clayton Dean in Tony Scott's thriller, Enemy of the State (1998), and as Captain James 'Jim' West in Barry Sonnenfeld's western-comedy Wild Wild West (1999, teamed with Kevin Kline and Salma Hayek). Always a rap artist, The Fresh Prince released his solo debut album, Big Willie Style, in 1997, which contained the hit singles Miami, Just the Two of Us (with son Trey), and Getting Jiggy Wit It. In 1999, he launched the CD Willennium as well as Men In Black and the Wild Wild West soundtracks. In the new millennium Will was given several title roles, including one in Robert Redford's adaptation of Steven Pressfield's novel, The Legend of Bagger Vance (2000, costarring Matt Damon and Charlize Theron). He also portrayed legendary boxer Muhammad Ali in Michael Mann's biography movie Ali (2001, also starring Jamie Foxx and Jon Voight). During 2004, Will could be seen in Alex Proyas' adaptation of Isaac Asimov's book, I Robot, and his voice can be heard in the animated movie Shark Tale. As for 2005, Will's fans can watch him portraying the title role in Andy Tennant's romantic comedy Hitch (costarring Eva Mendes). Smith will star in the upcoming films, Tonight He Comes, and Affirmative Action (costarring Ben Affleck). Successful Will Smith once commented, "People laugh, but if I set my mind to it, within the next 15 years, I would be president."